Last month, BCAction launched a new monthly webinar series designed to give our members opportunities to learn and share feedback about our current work. The first presentation, “The Politics of Breast Cancer,” was a great success! In case you missed it, the entire webinar can be downloaded from our website. On June 21 at 10:00 a.m. (PST) [1:00 p.m. (EST)], join us for “Patients Before Profits: What You Should Know About Breast Cancer, the FDA, and Big Pharma.” Click here to register. In April 2011, BCAction organized the “Roundtable Discussion on Latinas and Breast Cancer” to reignite much needed conversations around health inequities in breast cancer. We are working to build relationships across organizational boundaries and open up a space to explore partnerships with organizations focused on serving Latinas affected by breast cancer. Intervention at the policy level is frequently inadequate because social discrimination is often part of the policy-making process. As part of our ongoing roundtable initiative, BCAction is strengthening relationships with stakeholders directly impacted by social inequities to build collective power to attain meaningful change. Eli Lilly makes a lot of money from cancer. In 2010, Gemzar (a chemo drug used to treat breast cancer) was Lilly’s sixth-best-selling drug and made $1.15 billion in sales, despite the pending loss of patent protection. Lilly attempted to “double patent” Gemzar, a process where by conferring of a new patent protects a method of using a compound already covered in another patent. The Federal Circuit Court of Appeals had pr eviously ruled Lilly’s ’826 patent for Gemzar (gemcitabine HCl) invalid because it mirrored the ’614 patent on the drug. The ’826 patent — for Lilly’s method-of-use — wasn’t set to expire until 2013. The ’614 patent—which covered the compound—expired in November 2010. On May 16, 2011, the U.S. Supreme Court refused to hear the dispute. Usually, when patents expire, brand name drugs are then eligible for generic labels which typically reduce their cost and the profit to their original manufacturers. Let’s hope this means that patients who need Gemzar get it at a more reasonable cost. Let’s also hope that Lilly doesn’t step up sales of their cancer-linked rBGH in “developing markets” in an effort to make up for lost Gemzar profits. Among the top 10 pharmaceutical companies in the key emerging markets of Brazil, China, Turkey, Mexico, and Korea, Eli Lilly has the greatest growth. In 2010 Lilly’s increase in revenues in these markets was 13 percent. Lilly’s increase in revenues and increased interest in “developing communities” gives us pause for thought: underdeveloped countries with “developing” markets are a likely target for rBGH once it’s banned in the United States. We need them to stop manufacturing it so this doesn’t happen. Last fall, we mobilized 6,732 people to sign our online petition to Eli Lilly leadership, demanding that they stop manufacturing rBGH for which we received extensive media coverage. 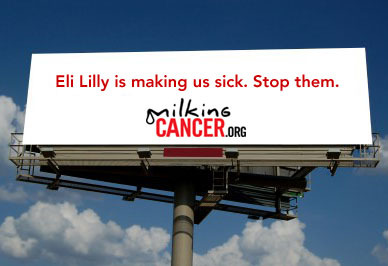 When we took our message to Eli Lilly’s hometown of Indianapolis through a billboard, billboard companies rejected our message, “Eli Lilly is making us sick. Tell them to stop.” This made a splash in the media as well. So we asked our 8,375 Facebook fans to be the billboard for us and post our billboard image and message as their Facebook profile image with a link to our campaign. Many of you have already done much to help us build the campaign so far, and there is still so much work to be done. We need to make lasting change. Eli Lilly must stop manufacturing rBGH. 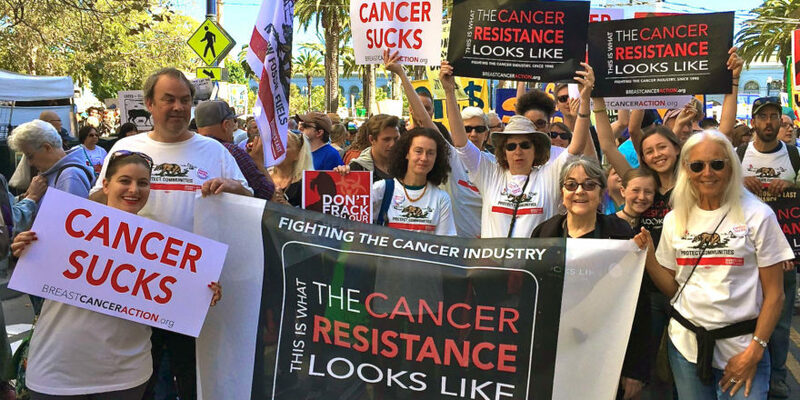 Join BCAction’s Milking Cancer campaign. Work alongside other groups dedicated to environmental justice, healthy communities, food justice, and corporate accountability. If you regularly blog, post comments on Facebook and Twitter, and are concerned about these issues, we need you. Your collaboration is vital to building groundswell. Find out what you can do. Organizations and individuals interested in working with us on the 2011 campaign should e-mail kirish@bcaction.org by July 1, 2011, with a subject heading: “Milking Cancer 2011.” Check regularly at www.thinkbeforeyoupink.org for updates and other ways to take action. Articles on detection and treatment do not constitute endorsements or medical advice but are intended solely to inform. Requested annual donation is $50, but no one is refused for lack of funds. “Breast Cancer Action,” ”Think Before You Pink,” and the BCAction logo are the registered trademarks of Breast Cancer Action. All rights reserved. Not to be used without express written permission.